I didn’t get to the 2 hours, my total time was 2hours:3minutes: 14 seconds!!! I know soooo sooooo close. I am trying to get to £500 for the Peace Hospice even if I didn’t quite do it in 2 hours, (3 minutes out) but I am so pleased to have done it and I promise I really did try so hard to get to that time, I had nothing left to give at the end. 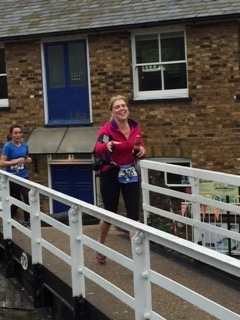 Amazing support around the course, Orlaith and Justin rushing around to the various locks to see me, I think they did their own race in supporting me….. thank you so much and great to see them and Rachel at the end. I am struggling to walk and can’t believe I have to work tomorrow, I really didn’t think ahead and book the morning off!! !